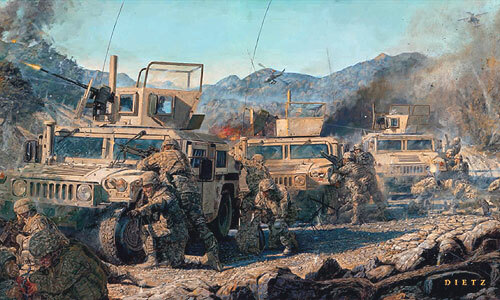 Overall Size: 31" x 21.5"
First Rock Paratroopers maneuver against Taliban and Foreign Fighters after they are engaged in a far ambush while moving through a dry river bed in Eastern Paktika province. All the while gunners and our brave soldiers deliver withering return fire; they are fixing the enemy position, setting up a support by fire with 60mm mortars to suppress with high explosive rounds, denying the weary enemy escape routes with the support of attack aviation and finishing the enemy force with close air support JDAM strikes. The mountainous and canalizing terrain Eastern Paktika Province favors the ambusher, a fact that the Taliban used to the best of their ability. Nevertheless, precise and efficient coordination with air and indirect fire support, superior physical stamina and discipline among our individual paratroopers, and constant training meant that during contact, Task Force Eagle and 1-503rd Airborne, always maintained decisive advantage. During Operation Enduring Freedom VIII, spanning from May 2007 to late July 2008, Task Force Eagle was responsible for maintaining security, improving governance and assisting with the development of Afghanistan's Eastern Paktika Province. The Battalion Task Force's area of operations included the sprawling tundra, rolling hills and craggy cliffs of the ten districts comprising Area of Operation Eagle: Gomal, Gayan, Bermel, Orgun, Naka, Zerok, Sar Hawzah, Southern Spera, Charboran and Sarobi. Over that fifteen month period, First Rock Paratroopers were involved in 346 troops in contact fights, fired just over 20,000 rounds of artillery and mortars, hit the enemy with 269 JDAMs, suffered 59 wounded in action and lost 12 of our beloved comrades to the conflict in the Eastern Paktika Province. Through all of the sustained fighting the paratroopers of Task Force Eagle remained focused on improving governance in close partnership with each district governor, driving development efforts through the expenditure of a dramatic $22.4 million toward essential road, education, irrigation and agricultural projects, and provided an added measure of security for the devout people of Eastern Paktika through constant capacity building efforts with the Afghan National Army, National Police and Border Police. The strides of the brave soldiers of this great Task Force, made through these long months and at such a significant cost in blood and treasure, left an indelible mark in the history of warfare and gave this corner of Afghanistan a chance to enjoy true democracy for the first time in their history.